Note: The opinions in this post are completely my own and not that of The Trek. In 2017 I hiked around 1500 miles of the Appalachian Trail. During that time I stayed at a lot of different places. Most of them were awesome but there were a select few that I disliked for one reason or another. Here’s a list of my favorite (and not so favorite) places to stay along the AT. I’ve arranged them by mile marker going north based off of the 2017 AWOL Guide. They’re each rated out of 5 stars! My next blog post will be a list of my favorite & least favorite campsites & shelters, so keep an eye out for that! Gooder Grove Hostel (Franklin, NC): Zen runs this hostel and knows just what hikers need. A clean bed/room, shower, laundry facilities, full kitchen, options to tent/hammock, & a tv room. It’s close to the center of town & the local church has a shuttle that will pick you up at the end of the driveway in the morning for an AYCE pancake breakfast if you’re there during the hiker bubble. Elmer’s Sunnybank Inn (Hotsprings, NC): If you’re lucky enough to get one of the very few rooms/beds in this place you are in for a treat! It’s right along the main street in town. $25 gets you a clean bed, warm shower, & access to a library & music room. The house was built in 1840 and is furnished with antiques. If you sign up in time & for some extra cash you can get an organic breakfast or dinner made by Elmer. I personally didn’t have either but friends of mine did and said they were delicious! Alpine Court Motel (Hotsprings, NC): The rooms were really dirty and smelled like mold. The carpet looked older and dirtier than I was. You also had to go to the liquor store to pick up the keys because the owner was nowhere to be found. I stayed in a lot of sleazy motels along the AT but this was by far the worst. Laughing Heart Hostel (Hotsprings, NC): My friend and I came here to pick up a package and to see if we could stay the night. The owner was in his office when we arrived. He ignored us knocking on the door despite there being a sign that said to knock if assistance was needed. When he finally did come out he walked straight past us and into the hostel. We waited patiently for him to have a free moment and asked if he had any bunks or tent spots left. He said no and walked back into his office. We waited another five or ten minutes for him to come back and finally were able to at least pick up our packages. Maybe he was just super busy or was having an off day, but completely ignoring potential customers is not the way to run a business. From what I could tell, it was a very clean hostel and had all the amenities you’d need as a thru-hiker. Rector Laurel Road (TN Mile 310.0): Apparently there used to be a hostel called Hiker Paradise here. It closed down early last year. Before I got here I started seeing signs along the trail advertising for a new hostel (Laurel Hostel). It was only a few houses down from where Hiker Paradise used to be. The signs that were a few miles before the road crossing advertised free shuttles to town with stay & free wifi. But the closer you got to the road, the signs changed to $20 shuttles. Then when we actually got there it turned out that it was $5 to get the wifi password and no matter how many people you had for a shuttle it’d still be $20 per person to go to town. We wound up stealth camping about .2 of a mile up trail and could hear the dogs at the hostel barking at the dogs across the street all night long. It’s definitely worth the short walk for a cheap soda & pizza cooked on the grill but I wouldn’t waste the money on a shuttle to town or to stay there. 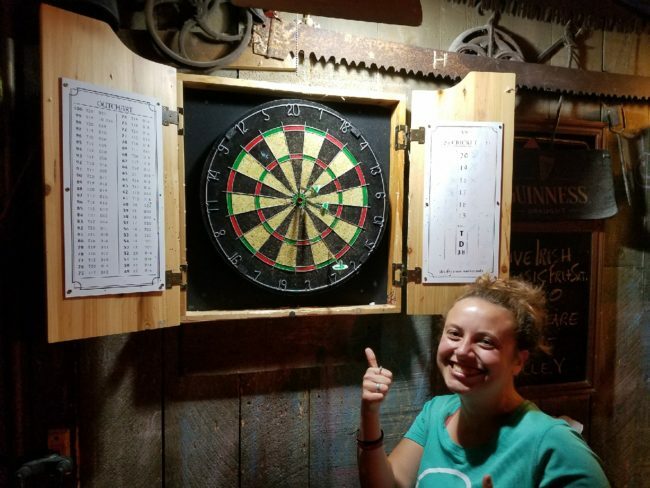 Uncle Johnny’s Hostel (Erwin, TN): I stayed at Miss Janet’s popup hostel when I got to Erwin but I have a bunch of friends that stayed here and said it was pretty awesome. The trail goes right next to the hostel so there’s no need to hitch when you get to the road crossing. Black Bear Resort (Hampton, TN): This is a campground that also has bunks & cabins to rent. They have hot showers, food for sale, tv room with a collection of dvds to watch, laundry, & a shuttle into town if needed. My tramily loved it here so much that we spent the day watching dvds and eating pizza. The grassy area where they allow tenting was the flattest & most comfortable spot I camped with my tent along the trail! River Trail Cabins The Lodge (Damascus, VA): My tramily and I decided to stay in Damascus for two more nights after trail days. A number of us were at different mile markers on trail and just wanted a couple more days to spend with each other before we all went back to hiking. I believe we had 11 or 12 people and it came out to about $40 each to rent this house for the night. We had a full kitchen, multiple bedrooms, a porch, laundry facilities, and multiple bathrooms. Perfect place to have one last get together with your tramily after trail days. The house is within walking distance of everything you need in town. Most of the hikers staying here that night decided to cowboy camp because we were too tired & lazy to keep going up and down the stairs. Holy Family Hostel (Pearisburg, VA): This is basically a self-serve hostel with a caretaker that checks in every so often. It’s just a five minute walk away from the walmart and also allows tenting if you’d prefer not to stay in the hostel. Donation based. 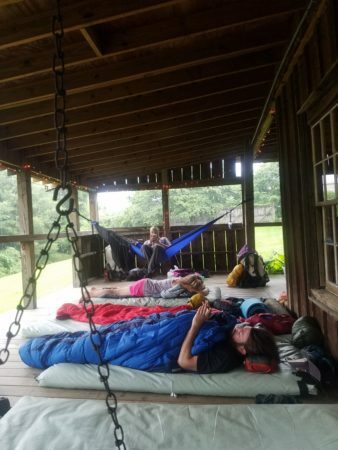 Angel’s Rest Hiker Haven (Pearisburg, VA): I personally didn’t stay here but everyone I know that did said it was an awesome hostel. They said it was very clean and that the owners are very nice people. It’s in the center of town and has all the amenities a thru-hiker needs. A word of wisdom though… if you have a package to pick up & they tell you it isn’t there make sure to check for yourself. Two employees checked for my package and couldn’t find it despite USPS’ website saying that my package had been delivered. The room was so small and had so many boxes that it made it really hard to find anything. I asked to check the package room for myself and thankfully found it. Four Pines Hostel (Catawba, VA): Now, it’s not a clean hostel by any means but it’s donation based so you get what you pay for. The selling point for Four Pines is the free shuttle to the Homeplace restaurant & convenience store whether you stay at the hostel or not. Note: There’s a gap between VA & Duncannon because I didn’t hike that section. I’m sure there are plenty of awesome hostels and hotels along that section of trail! The Doyle Hotel (Duncannon, PA): Pat and Vickey are the owners of this gem. The hotel is very very old and definitely shows its age. It may not be the cleanest hotel but it’s a place you must stay if you’re thru-hiking the AT. It’s only $35 for a double room ($10 for each extra person). Vickey makes sure to always have some clean loner clothes to wear in case you want to do all your laundry at the laundromat down the street. The bar/restaurant downstairs is convenient and affordable. Vickey is definitely the type of person that gives tough love but she treats you like family and is an excellent host! Pat cooked our meals when we ate at the restaurant and everything was very delicious! Stone Creek Cabin (PA Mile 1203.0): The info about this hostel in the 2017 AWOL guide was completely wrong. This is not a church hostel and they usually do not provide shuttles. Breathe Easy is a man that opens up his personal cabin to couch surfers & hikers. For a $5 donation you can stay the night, get a home cooked meal, have free reign over the pantry & kitchen to cook any other meals you want, shower, & do your laundry. The cabin is a short walk away from the AT. Breathe Easy is a wonderful guy and a great host. Ask him about his adventurous life. He has some great stories! Bert’s Restaurant (Palmerton PA): The restaurant has delicious food but it also has a small apartment in the back where they let hikers sleep for an affordable price. There’s only 5 beds so call ahead! The apartment has a tv & a huge collection of dvds in the common room. They also have small backpacks for slackpacking & a shower. Note: There’s a gap between Palmerton & NY because I didn’t hike that section. I’m sure there are plenty of awesome hostels and hotels along that section of trail! Hitching Post Country Motel (Cornwall Bridge, CT): I had no issues with the rooms at this motel. They were clean but way overpriced. I did however have an issue with the female owner. My friend and I left our room to go to the country store down the street. Halfway there I realized that I’d left my phone in the room so I turned around. When I got back to the motel I found our door wide open. I knew we’d closed the door because I remembered checking to make sure it was locked before we left. I went and found the owner. She was cleaning a room at the other end of the motel and said she’d left our door open to air it out. If she has an issue with smelly hikers then she should refuse service to us & not put her motel in the AWOL guidebook. She also should not leave our doors wide open for people to come in and steal things! From then on we made sure that one of us was always in the room so that she wouldn’t leave our door open again. The owner also came to our room at 9am (checkout is 10) and opened our door without knocking just to ask us if we were staying another night or checking out that day. Toymakers Cafe (Falls Village, CT): The owners of this establishment not only know how to cook but they also know that hikers generally can’t afford to stay at the one lodging location in town. That’s why they allow free tenting in their backyard. Just make sure to ask for permission first. Since the cafe is only open for breakfast & lunch you can have pizza delivered here for dinner. Berkshire South Regional Community Center (Great Barrington, MA): This community center is definitely the place to be if you’re staying in Great Barrington. They allow free tenting behind the building in the woods and even have tent platforms! They have a free community dinner on mondays & for $7 you can use their saunas, showers, & pool. Shamrock Village Inn (Dalton, MA): The owner of this motel is the sweetest lady! She didn’t have any rooms left and it was supposed to storm pretty bad so she let me and my hiking partner sleep in the hiker lounge for $5 each. And yes, that’s right. This motel has a hiker lounge! They have a hiker box, couch, tv, coin laundry, free use of their computer, wifi, and a few adorable cats. 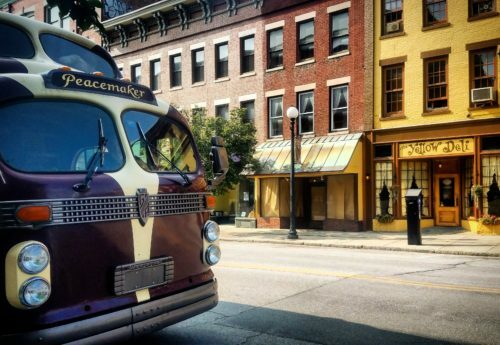 If you get the chance, definitely check out the Yellow Deli bus. It can comfortably sleep 18 people & has many hand carved wood details inside. Yellow Deli Hiker Hostel (Rutland, VT): The Yellow Deli may be run by what many say is a cult community but the people are nice, food is amazing, and hostel is very nice. The bunkrooms are separated so boys can’t go in the girls room and vice versa. Honestly I’m glad they were because the girl’s room was so clean. (No offense boys. There’s just more of you on the trail so your rooms were not as clean). Every bunk had a little basket full of tea & little goodies. The bathrooms were very clean and had homemade shampoos that smelled wonderful. If you’re there during their sabbath the hostel workers invite you to their free community dinner. Some hikers were extremely rude while I was there. They left during the 20 minute religious part of the night but came back when dinner was being served. I stayed the entire time and even though I’m not religious at all it was a good time. One or two scriptures were read, songs were sung, the little kids had a great time dancing to the music, and then members of the community shared what they were thankful for in life. The 12 Tribes community also prayed for us to have safe and healthy hikes which was very nice of them. Another great aspect of this hostel is the fact that you can slackpack yourself over Killington! Just take the bus to the trailhead and hitch/take a shuttle back. I stayed the max of three days and never felt like I was being recruited into the community. And yes, I drank the Mate. I’d never played darts before this day. Yet somehow I managed to get a few bullseyes! Hanover NH (NH Mile 1747.7): I got to this town on a very rainy & cold day. All of the hotels in the area were at least $150 a night and there’s no hostels. We even tried to get an uber to the next town over but there were none running that evening. The food co-op was expensive as well for resupply. There’s really no good hiker accommodations when it comes to spending the night here or taking a zero day. There was a list of trail angels and their phone numbers that most hiker-friendly businesses gave out to hikers. Maybe I was there on a busy day but out of all the numbers I either texted or called, only one answered. They told me they had no clue where two hikers could stay the night. It was still raining so my friend and I decided to go to the north face store to pick up our packs and hike on. The lovely man that works there had let us keep our packs & resupply boxes there while we spent the day in town trying to wait out the rain. When he heard that we’d had no luck finding a place to stay he offered to bring us to a cheaper grocery store to pick up some dinner & then brought us to a hotel in the next town over that wasn’t expensive. He told us if we couldn’t find a ride in the morning he’d bring us back to Hanover. We were able to take an uber from the hotel back to Hanover in the morning for about $10. Definitely try to avoid staying in Hanover if at all possible. And make sure to send yourself a resupply box to the North Face store to save money! Chet’s Place (Lincoln, NH): You won’t find this hostel named in any guidebook but you’ll definitely hear about it once you get closer to Lincoln. Word travels fast on the trail. Once you answer a few questions about the trail to prove you’re actually a thru-hiker, Chet will welcome you into the converted garage with open arms. There’s plenty of bunks & room to tent. Chet’s place has a fridge available to use, hiker boxes, laundry, & a shower. It’s within walking distance from town and is donation based. The only thing you have to do to stay here is to sign your trailname on a poster. This past year there was a group of hikers that almost ruined Chet’s Place for everyone else. They got too carried away with partying and one girl even puked on Chet’s neighbor’s lawn. Chet is an amazing guy with a crazy life story so please be respectful of him & his neighbors! Lancaster Yellow Deli (NH Mile 1844.4): After loving my experience at the Yellow Deli in Rutland, there was no way my friends and I were going to pass up staying at the Lancaster location. Especially since we’d heard rumors that they’d slackpack us over Mt. Washington. When we got to Crawford Notch we walked to the Willey House store because none of us had service. They were nice enough to let us use their phone to call the Yellow Deli. They weren’t going to be able to pick us up for four hours. We decided to get a hitch to the AMC Highland Center a few miles down the road to wait. When we got to the hostel we were shown around the place and told when breakfast was. We asked them about slackpacking and found that they truly did not understand what slackpacking meant. Their idea of it was that we’d all leave our shelters, cooking gear, extra food, & extra clothes at the hostel while we took 2-3 days to hike from Crawford Notch to Pinkham Notch. They told us we could rely on the huts for work for stay & food. What they didn’t understand is that the weather in the whites is completely unpredictable & that not all of the huts allow work for stay every night. Sometimes they turn you away. And sometimes you’re just too tired to even make it to a hut. Also, they told us the huts would give us food so not to carry more than a days worth. While that is sometimes true, it is also true that sometimes the huts don’t have any food to give away. We tried to explain to the couple running the hostel that what they were suggesting could be dangerous and in bad weather even deadly. They replied with stories of other hikers that had made the decision to do their “slackpack” and made it out alive. That night we asked what time we should be ready in the morning. We were told that it was up to us when we wanted to leave. So the next morning after breakfast some of us made a quick trip to the pharmacy to pick up some advil & other items. When we got back to the hostel we were yelled at for not being ready to go yet. All I had to do was get dressed and put a few things in my pack. I closed the door to the girl’s room to get dressed. A few seconds later the man running the hostel opened the door to yell at me again for not being ready. One of the hostel’s rules is that men are not allowed into the women’s room and vice versa. It was very surprising to me that he was breaking his own rule. Overall my experience at this hostel was not a positive one. If you’re injured or if you prearrange a pickup time then sure, stay here. It was very clean and within walking distance of restaurants and resupply options. But please do not do their version of slackpacking. You’re just asking to end up in a situation you’re not entirely prepared for. Stratton Motel/Hostel (Stratton, ME): Tree Hugger & Gypsy are past thru-hikers that were working there during my stay. (Both said they’d probably be there this year). They’re awesome people and make sure that the hostel section is kept clean & has everything that hikers need. Bunks, a bathroom with shower, & full kitchen available for use. The motel is within walking distance to food, resupply options, & the post office. They’ll also pick you up & drop you off at the trailhead. 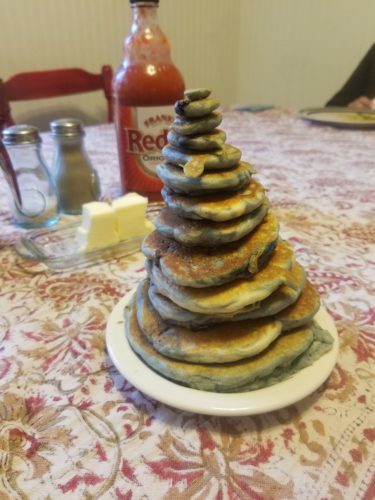 Poet made us a cairn of blueberry pancakes! Shaw’s Hiker Hostel (Monson, ME): I wound up staying here on three separate occasions… long story! Poet & Hippie Chick are amazing people and run a kickass hostel. It’s clean, has plenty of bunks, a small gear shop, lounge with a tv & Poet offers an amazing breakfast every morning that’s worth every penny. They also offer laundry, tenting & have room for hammocks. The hostel is within walking distance of anything you need in town & the stay includes a ride back to the trailhead. By the second time I stayed there I felt more at home than anywhere else on the trail. When Poet drops you off at the trailhead he’ll give you the most amazing advice whether you’re going north or south. Him and his wife are previous thru-hikers and are very knowledgeable about the trail so ask them any questions you might have! White House Landing (ME Mile 2144.1): There’s a blue blaze located about halfway through the 100 mile wilderness. Follow it and you’ll get taken by boat across the lake to an off the grid wilderness camp. Make sure you call ahead to see if there’s any bunks left. White House Landing may be pricey but it’s worth the stop if you have the money and/or you’re running out of food. You can choose either homemade pizza or a homemade burger for dinner & there’s an AYCE blueberry pancake breakfast in the morning. They also sell delicious homemade baked goods & a small amount of resupply options. They have a shower & will charge your cellphone overnight for you for $5. Pamola Motor Lodge (Millinocket, ME): This is a great place to stay after summiting Katahdin. There’s a bar downstairs where you can celebrate your hike with the locals & you can order food from the local italian restaurant to be delivered right to the bar. The rooms are cheap & within walking distance of anything you need in town. The owner also has a shuttle service and can bring you to Medway where you can catch a bus to Bangor and get a ride/flight home. Stuff like this should not be published. Opinions are bad for people’s business. Especially when some of it is here-say. My friend said it isn’t a good place so I give it one star?Why are post like this allowed which obviously hurt some people’s business. Some of those hostels are new and still trying to build a reputation. And in the process they get unfavoravle reviews by someone who didn’t even stay there? My post is no different than if I were to go on Yelp or Facebook and review the places on my list. It’s freedom of speech. Opinions may be bad for business but if theres enough bad opinions it most likely means the business isn’t a place you would want to spend any money anyway. When I was researching the trail I wished I had a list like this to refer to. Also, all of the here-say in my post were positive reviews. I didn’t write anything negative unless it was about my own personal experience. If you actually read my post you’d see that. In Hanover NH, knowing the hotels are WAY overpriced, the local AT community created a list of where you can call and get a place to stay (from a local). Usually in their house. This is typically posted at the shelter before Hanover. I found the locals very friendly and helpful. Of course, as you mention, your list above is not a complete list, just places you stayed. I would give shout outs to the Notch Hostel in Lincoln, NH, Green Mountain Hostel in Manchester Center, VT and The Wood Hole Hostel in Pearisburg, VA. And then there is the folks at the Hiker Hut and The Caratunk House in ME who went WAY out of their way to help be get off the trail and home when I broke my ankle (10 stars here). I did get a copy of that list in Hanover and no one answered their phones. The one person that did answer didn’t get back to me until I’d already booked my motel room in the next town over. She told me she didn’t know where my friend & I could stay so it didn’t matter anyway. I didn’t stay at the Notch Hostel but thwy gave me a hitch to the trailhead from Lincoln and were very nice. If I hadn’t stayed at Chef’s place I definitely would have stayed there! Ugh, I’m using my phone so of course autocorrect messed up what I meant to say.